Back in July, Jaman, which sells high definition movie downloads, announced that it was on the verge of releasing the first commercial plug-in — or is that hack? — for the AppleTV. 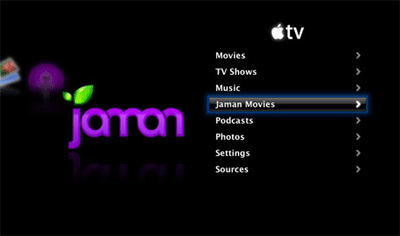 With the software installed, movies downloaded via Jaman’s desktop software, running on a Mac or PC, would also show up in a new menu option on a user’s AppleTV. If released, this would represent the first time a commercial entity had successfully plugged their service into Apple’s set-top-box, to create a level playing field with the company’s own content offerings. That day has finally arrived, albeit with a pretty heavy caveat: While Jaman’s website points to where users can download the necessary software, along with instructions, the AppleTV plug-in isn’t officially supported by the company. That’s because Jaman’s solution still requires users to “hack” the device, since Apple is yet to sanction the AppleTV to run third-party applications. Thanks for the plug, Steve. I’ve been using the Jaman service for a couple of weeks now and I have to say that it is a joy to use. Though no blockbuster Hollywood movies are available on the site, I do find independent movies offered by the service to be quite entertaining.